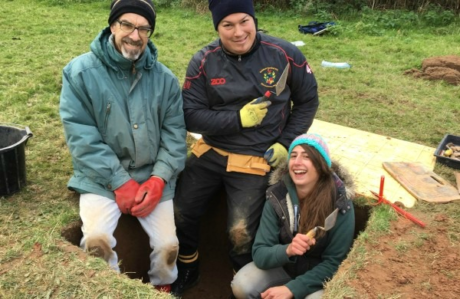 In Pictures: An Archaeological Biopsy At Oldbury Camp! If geophysics is like an x-ray, then here’s why digging test pits is the archaeological equivalent of a biopsy. Out in the West Country, right on the banks of the River Severn, lies Oldbury Camp – a rare lowland hillfort. Known locally as The Toot, its huge earthen banks are visible from the air. Over the years, bits of Roman pottery and coins have turned up, but archaeologically, it is yet to be investigated. How old is it? What was it used for? And why, unlike most other hillforts, isn’t it built on top of a hill?! Finding out will require a full-blown excavation, but in order to do that, we’d need to dig 10 test pits across the hillfort. From each one, we’d extract a small, precise sample of the archaeology to diagnose what survives, and where, before deciding where to put full-size trenches… like the archaeological equivalent of a biopsy! We invited 20 Dirty Weekenders along to help us carry out the operation. Here’s how we did it. Each one measured 1x1m and, with the turf stripped, we were ready to go! Juan and Barry dug theirs very quickly – already up to your arm pits? Oh my! Yes, this is Old-baaaaaaaaaary Camp! So what did we actually find? We also learned where we’re most likely to find nothing at all… Sorry Barry! And a huge big grin from Amanda, our Finds Manager! We hope you’ll join us! But if you can’t wait until then, you CAN check out the 3D photogrammetry model that Adam made. You can even click on each of the test pits to take a look inside! © 2019 DigVentures Ltd. All rights reserved.